I don’t like to opine on the stock market, and again I emphasize that I have no idea what the market will do in the short term. Nevertheless, I’ll follow the lead of a restaurant that opened in an empty bank building and then advertised: “Put your mouth where your money was.” Today my money and my mouth both say equities. The S & P 500 is imperfect as well. It’s criteria exclude Berkshire Hathaway, for example, which is odd at best. It is a constructed index. That is, unlike very broad measures like the Wilshire 5,000, which is a very close proxy for the American stock market as whole, the five hundred large companies within the S & P are selected (and de-selected, which creates difficulties in interpreting historical price comparisons) based on issues of market sector and so on. But it is still a pretty good proxy for the market. According to the S & P’s own claim, the index covers about 75% of the total capitalization of the American stocks. It is a much, much better measuring stick than the Dow. The Industrials index retains its cachet as a brand; it is not that good a tool. Let’s move on please. 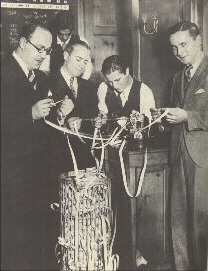 Image: “The excitement before the bubble burst” – people looking at ticker tape in front of a stock ticker, probably sometime in 1929. http://www.ssa.gov/history/wallst.html. Source: Wikimedia Commons.